Celebrating 20 year of dedication to Corporate clients and Talented people across the USA and the world, we thank you for contacting us! Please let us know how we can serve you. Allow 12 -24 hours for review and job posting. Include your email address and phone number with best time to reach you for quicker response. If you do not see the job posting within 24 hours please contact customer service. 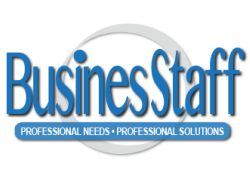 ​Thank you for using BusinesStaff Recruiting services and AS/Personnel Agency, Inc. We appreciate the opportunity to serve you.